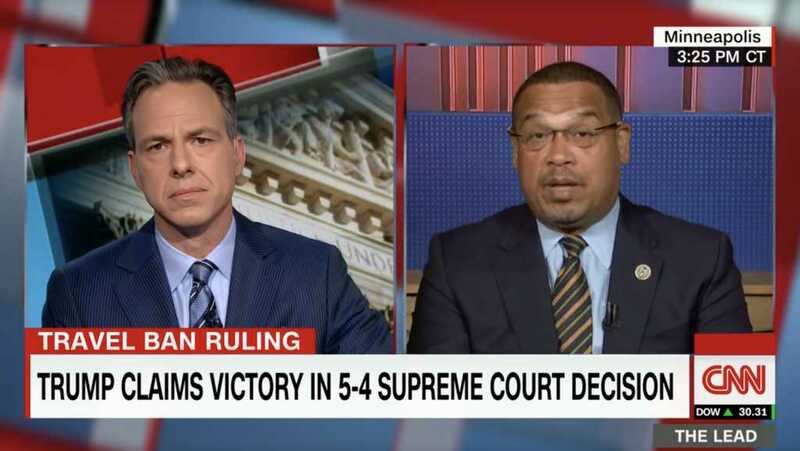 CNN’s Jake Tapper turned the tables a bit Tuesday on Rep. Keith Ellison (D-Minn.) after the lawmaker called out President Donald Trump for being “bigoted” against the Muslim community. Ellison, who serves as the deputy chair of the Democratic National Committee and is Muslim, rebuked the Trump administration for its controversial ban on entry into the U.S. from a handful of Muslim-majority countries, a policy the Supreme Court ruled this week was well within the president’s purview. “You’ve been decrying President Trump’s bigotry, obviously you used to follow somebody who continually expressed sexist, anti-LGBTQ, and anti-Semitic bigotry, Louis Farrakhan,” Tapper pointed out, noting the lawmaker’s past affiliation with the infamous Nation of Islam leader. Ellison, clearly perturbed by the CNN host’s assertion, repeatedly pushed back on the suggestion that he ever associated with Farrakhan, a well-documented anti-Semite and misogynist, and also denied a Washington Post report that gave him “four Pinocchios” for claiming his relationship with Farrakhan ended in 2006. The Post pointed to an undated video recorded sometime between 2010 and 2013 that showed Ellison in conversation with a group of men, including Farrakhan, during an event in the Dar Al-Hijrah Islamic Center in Falls Church, Virginia. Then on Sept. 23, 2013, Ellison attended a dinner for Iranian President Hassan Rouhani alongside at least 30 other prominent American Muslim leaders, also including Farrakhan. Nevertheless, Ellison apparently sees the entire topic of Farrakhan off limits.